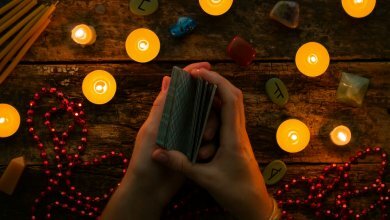 Home/Blog/Tarot/The Tarot and Your Sun Sign – What’s Your Archetype? 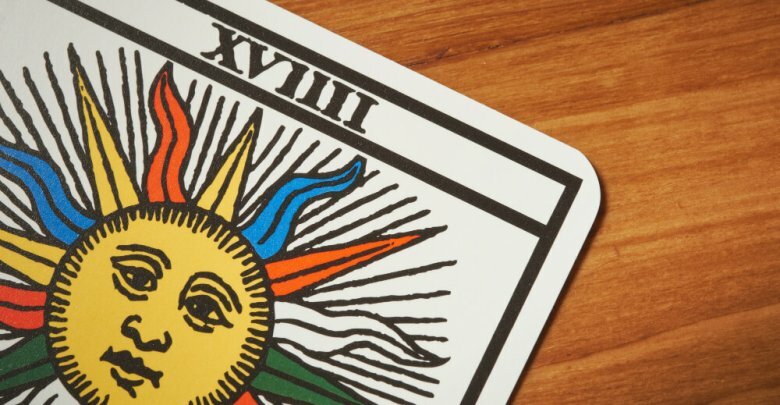 The Tarot and Your Sun Sign – What’s Your Archetype? 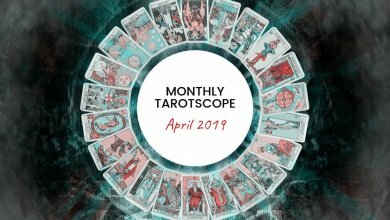 Astrology and Tarot are separate disciplines with distinct histories and traditions, but there are powerful connections between them, with many astrological associations embedded in the Tarot. 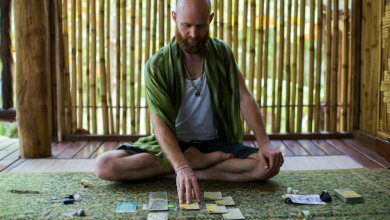 The Major Arcana cards shine a light on life-changing situations and events or draw attention to some crucial aspect of your own personality or behavior, demanding attention at the time of the reading. 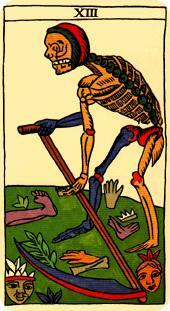 Each sign of the Zodiac is linked with a Tarot card from The Major Arcana. 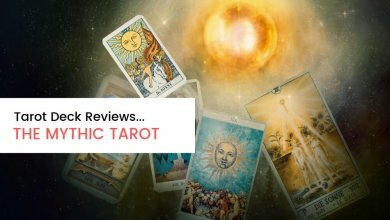 Your sun sign and your Major Arcana card represent key archetypes. But what exactly is an archetype? Psychoanalysis (in Jungian theory) a primitive mental image inherited from the earliest human ancestors and supposed to be present in the collective unconscious. The archetype represented by your Major Arcana card does not define you, of course, any more than your Sun sign does. But it represents a key concept that chimes with your Zodiac Sun sign. Discover the Tarot’s Major Arcana card for your zodiac sign below! Astrological archetype: The Ram. The Warrior. Spring bursts forth after winter and so does The Emperor in you. We can’t just creep through Life. We need to push sometimes or we would never get anywhere. The Emperor is fiery, energetic, driven and determined, good at delegating but controlling – some might even say bossy; A battering ‘ram’. The Emperor may be accident-prone due to general speed and haste. He needs to learn how to take it easy, and slow down, to be more careful and patient, to stay curious and listen to the ideas of others. He’s not the only Emperor. Astrological archetype: The Bull. The Farmer. This card is about the power and wisdom of the written words and of tradition. Books, publishers, churches of all faiths and universities are indicated by this same card. 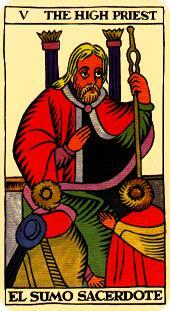 The High Priest (Hierophant) does things by the book and has faith and trust in the old ways. He is all about standards. He is a protector, a gardener, a teacher, a mentor, a scholar, but the other message of this card is that change can be good, even necessary, and that does not necessarily throwing out any baby with the bathwater. Astrological archetype: The Twins. The Jester. This card has another name: ‘The Decision.’ Gemini is quick-witted, but sometimes decisions need more care and time than Gemini gives them. 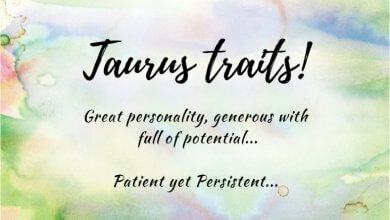 There is a certain innate restlessness, Gemini can be quick to walk away, when just sometimes they might do better to stick at things, even if they are bored, or the going gets rough. Gemini is the archetype of the Jester, the one who can take any turn of fate with a laugh and makes sure we remember to enjoy ourselves. This is the wisdom of Gemini. What we can’t joke about, we can’t deal with. Astrological archetype: The Crab. The Mother. 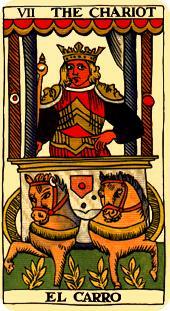 Your Major Arcana card is The Chariot – (movement, progress, effort, co-operation). The Crab is famously gentle, home-loving, intuitive, private; even secretive, but just look again at this guy/girl. This is Cancer’s Tarot face. The Chariot carries the victorious on parade. The Chariot takes us places. This is a card of triumph through discipline and sustained effort; the harnessing of resources, the charioteer and the horses working as one. Choose your teams well, and you and they can do great things together. A carer is not a servant, and the gentleness of Cancer does not make it a doormat. No way. Astrological archetype: The Lion. The King. Life demands the courage to meet it head-on. To learn new things you have to take chances and risk failure. But the fire of Leo also demands control. 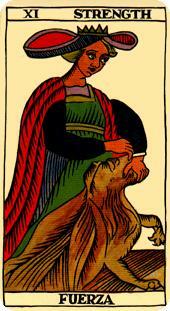 The lady patiently restrains the lion. It shall not devour her. She shall not try to harm it. The lion represents the spirit of the Leo subject. There is natural courage and charisma, but the Lady represents strength with gentleness and restraint – moral courage. The lion does not want to be ruled, but nor do others, and tyranny is always to be resisted. Astrological archetype: The Virgin. The Craftsman. 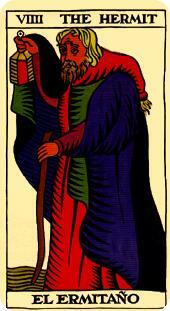 The Hermit often likes to walk alone, and this is usually by choice. Time alone, especially in quiet, wild, green places, is especially good for the Hermit, male or female, married, or single. People turn to the Hermit for wise advice. The Hermit knows how to listen and sees more than he or she says. The Hermit shines a quiet light along his path. See the lantern in his hand. See the staff. People respect The Hermit and know they may approach in safety, and animals trust him too. Astrological archetype: The Scales. The Judge. 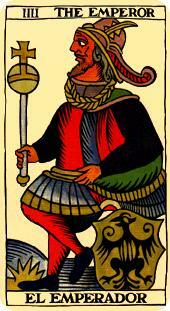 Your Major Arcana card is Justice – (fairness, reason, rule of law, striving for what is right). Libra combines analytical ability with intuition, and natural grace and charm, with a talent for diplomacy. Justice is capable of severity, however, and can just now and again be overly keen to apply the letter of the law, forgetting the spirit. See the Sword in the hand of Justice. But the scales don’t stay still. They are rarely in perfect balance. They see-saw, like Libra’s moods and occasional indecision. Libra is changeable. It may be the only sign of the Zodiac represented by an inanimate object, and a Libra subject may be a born judge, but still, they are only human. But without Justice, there would be chaos and misery. Astrological archetype: The Scorpion. The Actor. There is no life without death. There can be nothing new without something else changing or ending. But just like the song, the seasons don’t fear the reaper. Death is not the enemy of Life. Scorpio understands this great mystery. 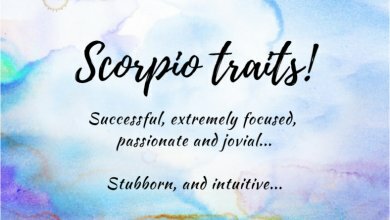 Intuitive, subtle, often somewhat secretive, charismatic, intense, Scorpio is devoted to their loved ones, while with others they may be a true friend and powerful ally – or a vengeful enemy. Death has a long memory. He has seen it all before. Get in the way, and he may mow you down with that scythe. Sometimes it is better to walk away. Sometimes it is wiser to call it quits and call time on something that no longer serves you well. Astrological archetype: The Archer. The Explorer. 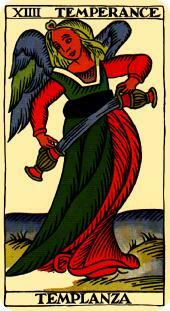 Your Tarot archetype is Temperance – (sweet moderation; reason, understanding, healing). 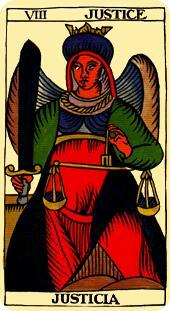 Temperance was regarded as an angel- a force for virtue at the time the Tarot was first in use. Temperance is about moderation, and self- control, and the avoidance of extremes. But Temperance has other meanings…alchemy, the fusing together of two elements, materials or qualities to make a new thing stronger than either individual element; Intellect and feeling, ability and ambition, one person and another, one people and another. This is a force for diplomacy, reconciliation of differences and also for physical healing after an illness. Astrological archetype: The Goat. The Builder. You are hardworking and trustworthy, with an often understated glamour and a keen, if a dry sense of humor. The Devil comes in many guises; often powerfully attractive. Think of animal magnetism. That’s Pan for you. You are hard working. You set yourself high standards and expect the same of others, but you sometimes feel you cannot claim as much freedom for yourself as you need. See the chains of the Devil’s captives? Those captives can escape if they really try. Their chains are loose. The Devil reminds us that we can get trapped by our own behavior but we can choose to liberate ourselves by changing the behavior. 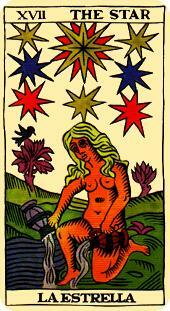 The Star has much in common with the imagery of the Aquarian Water Carrier. It shines its brightest, far-off light when everything else looks dark. The figure in the card has one foot in the water, symbolizing her powers of intuition, and the other foot still on land, is symbolizing her underlying stability. Her knee is a bridge between elements. The stars symbolize the card’s over-arching message of guidance, hope, and inspiration. 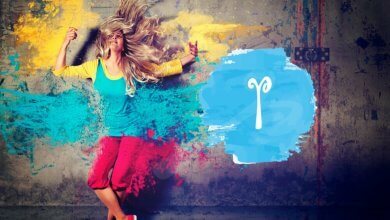 Aquarius loves people as a general concept, but she is not one to blend in with the crowd, symbolized by the biggest star above her head, which is set apart from the others. Astrological archetype: The Fishes. The Seeker/Self Sacrificer. Like Pisces, The Moon card is associated with the subconscious and suggests that things are not always as they first appear. 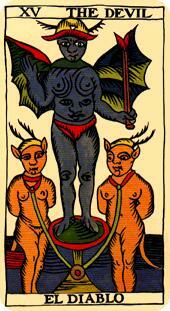 The Moon card also represents our secretive side or “shadow self”. 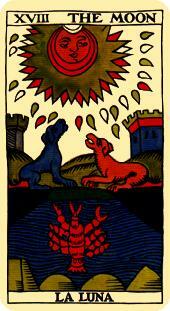 The barking dog and the wolf in this card represent Pisces’ wild side sitting alongside its more domestic self. 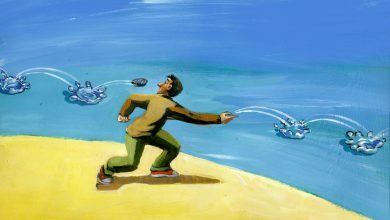 Pisces is gentle but the pull of the wild is strong, and so is the pull of the ocean’s tides. Their inner life is powerful. These people are deep. The crayfish crawling from the water represents “coming into consciousness” and the possession of psychic abilities, true of all signs in their different ways, but especially of Pisces. 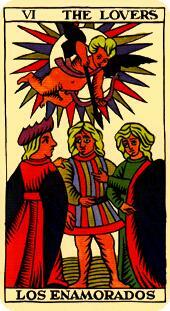 Images: The Tarot de Marseilles, Public Domain.